Home Business and Money Community Development Educational Empowerment Scholarships Inspiration and Motivation Job Opportunities Meet Aishat Raufu - An Inspiring Nigerian Female Shoe Maker. 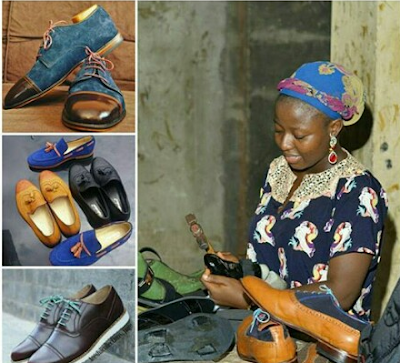 Meet Aishat Raufu - An Inspiring Nigerian Female Shoe Maker. Aishat is a shoemaker extraordinaire whose story is filled with focus and the determination to succeed. After graduating from the university, the 24-year-old searched for job but couldn't secure any. Entrepreneurship was not the dream, but she was able to give shoe making a trial. start-up capital, Aisha has been able to turn her shoe business into a big enterprise. She has been able to prove to the world that she made the right decision by distinguishing her products in a male dominated industry. "Being a shoemaker was born out of joblessness. As a kid, I always wanted to become a Banker," the Kwara State native says. "I never would have thought I would ever become a shoemaker, if I were not jobless. More so, my love for shoes has kept me in the business. Whenever I see a piece of leather in the market, the next thing that comes to my mind is what I can produce with it. At first, I was doing it for the money, but I got to realize my love for shoes was more than the money I was making from the business"
Just like there is no business without challenges, Aishat's is about getting an investor. "It amazes me that in this generation of ours, some people will tell you that they don’t or cannot invest in a shoemaker because she is a woman or they cannot invest in you because you refuse to sleep with them," she reflects. According to her, the goal has always been to establish Nigeria as a major hub of fine quality leather shoes. The one project on her mind is a training school for kids on how to make shoes during the summer holidays. She is also looking at bringing in machines from Italy and China to help improve quality, quantity and perfection in production. Aishat's journey has indeed shown that if one does what one wants to do and follow one’s gut and instincts, one can be successful. The lesson to be learned here is simple - don't ever be afraid to explore your potentials! Please where is her shop? Thanks for ur numerous posts, its insightful.